Leveraging on our years of market experience, we have established ourselves as a prominent manufacturer, supplier and exporter of various Grades Of Ramming Mass. The offered product is basically burnt magnesite, obtained after mixing some chemicals with it. Due to being free from impurities and having complete abidance with international quality standards, these are extensively used in the lining of induction furnaces. Our Ramming Mass is widely praised and demanded by customers due to possessing attributes such as corrosion resistance, thermal stability, and having less or no binders, fire clay and moisture. 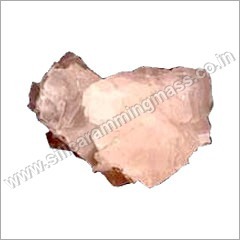 Moreover, contact now for buying all Grades of Ramming Mass from us at reasonable rates. Normal: In it, silica content is present around 98.50 % to 99 %, it is one of the cheapest grade available in the market. Normal Premix: This ramming mass belongs to pre mixed version, prepared by mixing Boric Acid as per the requirements of customer requirements.